Fuji (富士?) was the lead ship of the Fuji-class of pre-dreadnought battleships built for the Imperial Japanese Navy by the British firm of Thames Iron Works in the late 1890s. 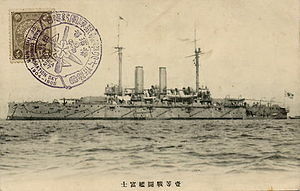 The ship participated in the Russo-Japanese War of 1904–1905, including the Battle of Port Arthur on the second day of the war with her sister Yashima. Fuji fought in the Battles of the Yellow Sea and Tsushima and was lightly damaged in the latter action. The ship was reclassified as a coastal defence ship in 1910 and served as a training ship for the rest of her career. She was hulked in 1922 and finally broken up for scrap in 1948. Fuji was 412 feet (125.6 m) long overall and had a beam of 73 feet 6 inches (22.4 m) and a full-load draught of 26 feet (7.925 m). She normally displaced 12,533 long tons (12,734 t) and had a crew of 637 officers and enlisted men. The ship was powered by two Humphrys Tennant vertical triple-expansion steam engines using steam generated by ten cylindrical boilers. The engines were rated at 13,500 indicated horsepower (10,100 kW), using forced draught, and designed to reach a top speed of around 18 knots (33 km/h; 21 mph). Fuji, however, reached a top speed of 18.5 knots (34.3 km/h; 21.3 mph) on her sea trials. She carried a maximum of 1,200 tonnes (1,200 long tons) of coal which allowed her to steam for 4,000 nautical miles (7,400 km; 4,600 mi) at a speed of 10 knots (19 km/h; 12 mph). The ship’s main battery consisted of four 12-inch (305 mm) guns mounted in two twin gun turrets, one forward and one aft. The secondary battery consisted of ten 6-inch (152 mm) quick-firing guns, four mounted in casemates on the sides of the hull and six mounted on the upper deck, protected by gun shields. A number of smaller guns were carried for defence against torpedo boats. These included fourteen 47-millimetre (1.9 in) 3-pounder guns and ten 2.5-pounder Hotchkiss guns of the same calibre. She was also armed with five 18-inch torpedo tubes. Fuji’s waterline armour belt consisted of Harvey armour and was 14–18 inches (356–457 mm) thick. The armour of her gun turrets was six inches thick and her deck was 2.5 inches (64 mm) thick.